The Aggregation approach. It can offer a number of separate ‘internationalised’ or global subjects or units, usually as electives. This model is the simplest and most common approach. Typically stand-alone international units of study are included as electives in the law program. Its limitation is that as internationalised aspects are limited to certain electives or specialist programs, only a small cohort of law students is likely to be exposed to a globalised learning experience. The Segregation approach. It can establish one or more separate institutes or centres devoted to internationalised or global aspects. This model is more about how a law school structures itself rather than the curriculum itself. Adopting such an approach still leaves open any of the other approaches so far as teaching is concerned. The Integration approach. It can incorporate internationalised or global elements across the whole curriculum, and beyond into research and student services. The integration model incorporates international and intercultural dimensions across the whole curriculum, including of course core subjects. The Immersion approach. It can provide opportunities for its students to go elsewhere to study in a different jurisdiction. 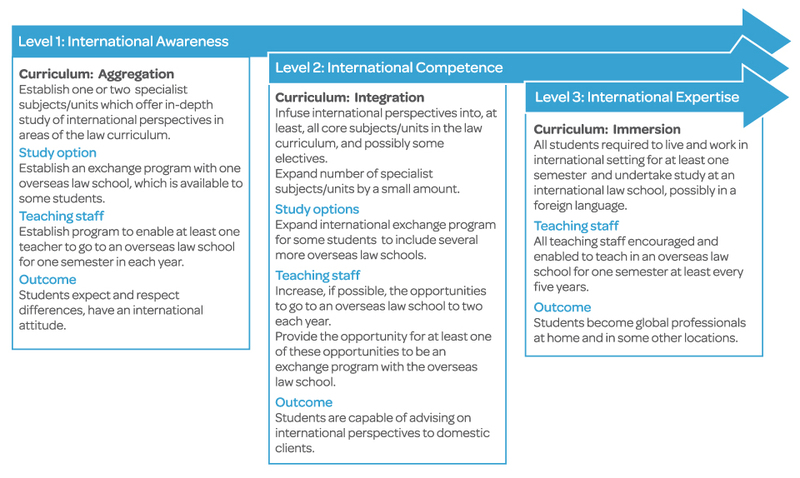 This model is the most challenging to achieve as it aims to deliver a high level of international competence, expertise and experience, which may allow law graduates to practise in multiple jurisdictions. However, it is inevitably limited to those students who are able or willing to study in another jurisdiction. In reality, the implementation process will most likely be an incremental and accumulative one that may start with the inclusion of select content or units, with the gradual infusion of international dimensions across the whole curriculum to the possible implementation of a fully integrated immersion model.